“Field of Dreams” for a Geologist! Geology students listen as Charles Beierle from the Nature Center explains the key features of the geology amphitheater. 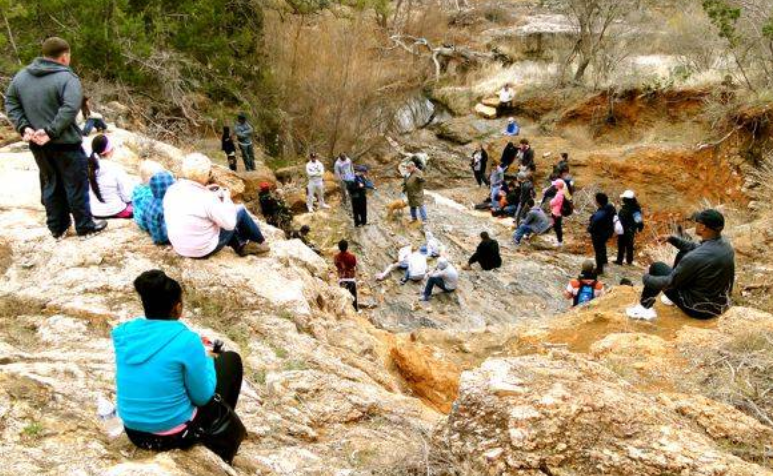 Over the course of a couple of weekends, 80 college students and professors from Austin Community College and Central Texas College recently explored the geology amphitheater, located just down the hill from the nature center. The amphitheater was created in the 2007 floods caused by the 20 inches of rain that fell over four short, wet hours. When the waters subsided, this treasure trove of geology was revealed. The nature center geologist described it as “reading postcards from the past.” In this case, the postcards dated from about 1.2 billion years ago!! One of the students said it was like walking thru his text book, all of the geological rock classifications are present and within easy reach. From the core elements of nature’s mountain building process in igneous rocks, to the layering from the sedimentary period of development and the fusing and formulation of metamorphic rocks, it’s all there. 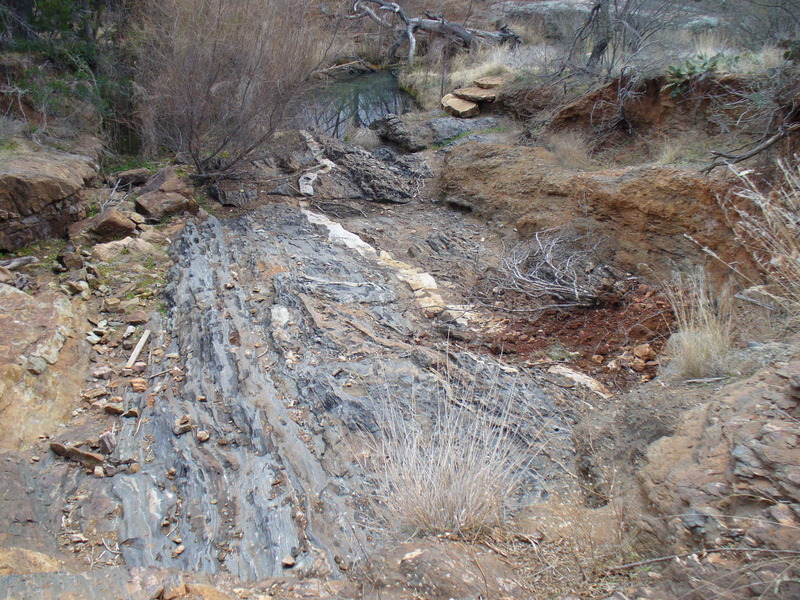 Also clear is the destructive force of nature, with thousands of gallons of water a minute rushing thru the creek and eroding tons of materials, uncovering rocks that have not seen the light of day in tens of thousands of years. In the photo above, the twisting, layering, faulting and uplifting visible in the rock face tells the story of the geological heart of Texas. Notice how the rock looks folded and is turned on edge so we can clearly see the layering. Also note the white stripe within the darker rock above, called a xenolith. It is amazing to think of the power required to force the one into the fault line of the other, and that the white material, in this case granite and quartz, is actually 300M years younger than the material surrounding it. Examining the size of the schist crystals, we can tell how quickly the material cooled, and we’re talking in terms of hundreds of thousands of years to cool and form these crystals! As these student can attest, if you want to make your favorite geologist happy (especially your professor) just bring them out to the nature center and let them explore to their heart’s content. It was a wonderful way to make science real. Previous PostNature Center welcomes a new residentNext PostBrownies have an exciting day! This excursion for our geology classes was an exceptional addition to our courses. The contact between the Town Mountain Granite and the Packsaddle Schist (unearthed during the floods of 2007) yields a view into the Precambrian eon and gives a much more intriguing example than can be viewed in any text. 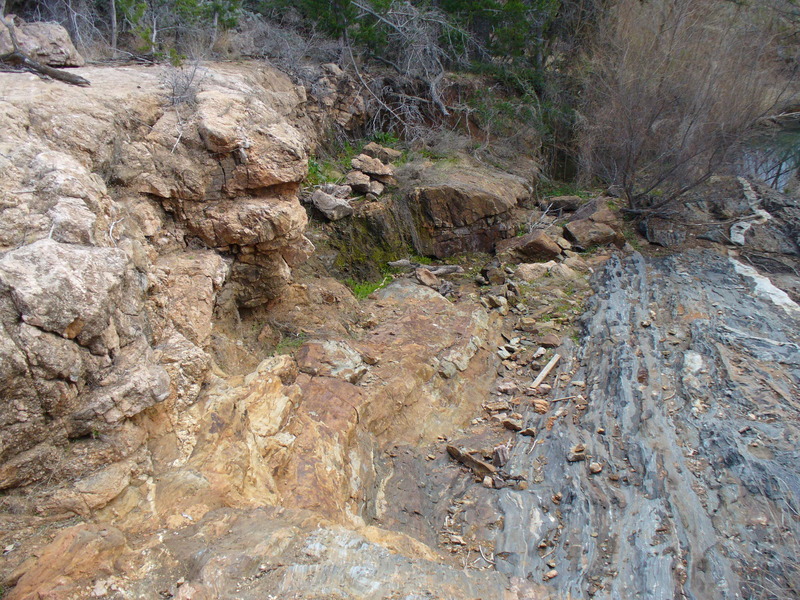 Additionally, the hike to Reveille Peak traverses the Valley Springs Gneiss and offers a terrific high vantage of the fantastic Central Texas geology and the Llano Uplift. Bravo to the staff for helping with this field trip!